One of the great products you can earn for FREE in the new Sale-A-Bration (starting 28th Jan) is the gorgeous Heartfelt Banner Kit. 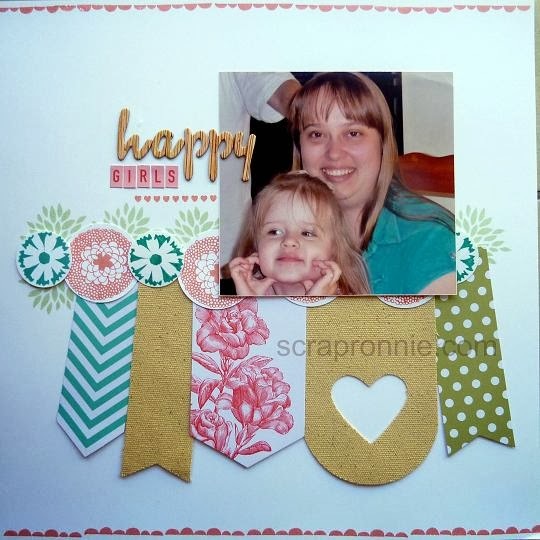 Being the devoted scrapbooker that I am, so soon as I saw the kit, I knew I would use the pieces for layouts instead of a banner!! I teamed it up with one of the stamp sets you can also earn for free, and came up with this cute page! Materials: Heartfelt Banner Kit (133514), Petal Parade stamp set (133599), Make Note Rotary Stamp (133370), Whisper White Cardstock (124302), Crisp Cantaloupe( 131176), Pistachio Pudding (131177) and Bermuda Bay (131171) ink, 1 3/4"circle (119850) and 1 1/4"circle (119861) punches. There are so many items you can earn for free this year during Sale-A-Bration. If you would like a copy of the brochure, contact me here.